This delicious wine bursts with flavors of honeydew, melon, lime, and honeysuckle. 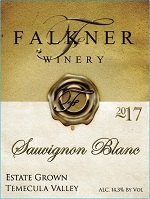 This is an Estate Grown Sauvignon Blanc and is a wonderful wine for just sipping. This wine pairs well with seafood (especially shellfish), chicken, and cheeses.